On Saturday, while heading down to the boat ramp to put the boat in the water, I noticed the gate to the Forest Road wide open! First time I ever saw that. I have been meaning to ask Gerry what the spray paint is on the trees near the old Jalopy means but if I remember what he explained awhile back, red paint means firewood cutting. So it looks like there is some thinning going on for firewood. My first Father's Day ride, was done over at Sunny Valley and I was actually considering riding something different today but since we got over two inches of rain last night in the span of an hour, I thought it might be worthwhile to see how the Upper Gussy held up to that much precipitation. I was hoping for some cooler weather but it was pretty steamy. Tried wearing some glasses for the ride but had to loose them by the time I hit the Gussy. Climb up the Forest Road was pretty good. I am now 4 for 4 on everything but I thought I was going to stall at one point because the rain made everything slick. Most of the upper part of the trail drained nicely. My tires squished through some areas that will need addressing at some point. Hit all the up and overs. Nothing beats a 29er in this department. Made another one just down from the big one that I built a couple of days ago. I think the log has rolled somewhat making the north side a little too steep of an angle so I put some covering rocks on both sides so that you can keep the flow. It's a good thing that I decided to wear my leg armor this morning because, halfway down the trail, I hit a technical climb, stalled out, and went down like a sack of potatoes. While the 29er rolls over stuff more efficiently, you need to have a little speed for that efficiency to be efficient. I just wasn't paying attention, stalled out on a rock - didn't roll over it - and down I went. Re-rode that section with a little more speed and went right through there. Same thing happened at the Wet Spot. This section is really technical and I have cleaned every time I have ridden it in the past but for some reason my head just wasn't in the game today and paid for it. This time I went OTB (over-the-bars) and the bike came with me. I am so conditioned for these types of falls that I executed a perfect OTBLF (over-the-bars-landing-fall) but this part of the trail has so many rocks, it was still painful on the hips and shoulder. The Qball did pretty well but as you will further down my right brake lever didn't fare so well. It was bent downwards. I think the problem is in the picture above, you have to hit the gap between the two rocks. I have stalled out there a number of times. Today, I hit the rock on the right, and again not enough speed on the 29er to achieve the proper roll-over effect, caused a classic OTB situation. Rather than remove the rock, I decided to give the one rock a little transition. As you can see in the picture below, my right brake lever got bent. Now it matches the left brake lever that I bent at Troutbrook last year. These two shots (above and below) show how really bent the lever is. Thank goodnes for mechanical disc brakes! I just have the to take off the brake cable and take the bars off the stem to fix this situation. Just have to but the lever in the vice and bend it back, or at least enough so that I will be able to use it again. Above is the profile from of Today's ride, from start to finish. Still a little variation between start and finish. Not sure why that happens but I might research it and find it why. 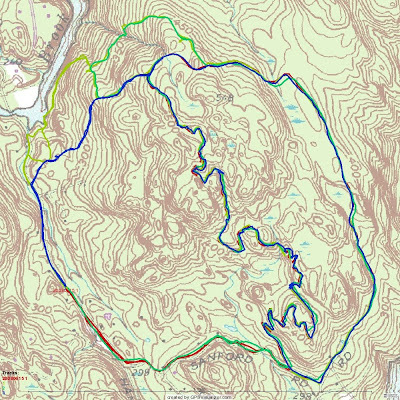 Below is where I have been riding at Upper Paugussett the past few days. Stayed off the Mulikin Trail today because of all the wetness. I am still in a quandary of what to do for this trail. After the big up and over, it's just so wet to the stone wall that I am thinking about lining that section with flat stones so that you are not riding in the mud.